This morning I’ve already been exploring blogs on how people quit television time cold turkey. We tend to watch Netflixs or Amazon on a daily basis around here. Granted, the shows are typically educational but even so I am fully aware of the research being done that shows the negative impact of tv time. In fact, we’ve started telling the kids that the tv is making their brains rot and when they ask for more, we sniff their ears and holler, “Ewww! Stinky rotting brain!” just to make an impression. One of the most consistent recommendations I’m seeing from folks that have quit tv is to replace it with something else, like Board Game Night or Family Walk or Bowling Night, etc. I’m trying to practically fit these ideas into our life. 1. Tenzi. Oh man, this is a winning game for us! We’ve been able to play it for the last year, so we can vouch it’s pretty good for ages 4 and up. 2. Monopoly. The tried and true classic – still a winner around here. The girls have been playing it for about two years, which means it’s good for probably ages 5 and up. Bubby is still bored out of his skull and not at all interested in playing. 4. Timeline. OK, OK, the kids are kind of stinky at this game. But they’re not bad thanks to the history component of their schoolwork. The parents, though, we LOVE this game! 5. Kerplunk. Bubby (the 4 year old) loves this game. So much so that he steals the marbles and hides them in his pockets and then I find them in the washing machine later and shake my hands in the air. 6. Apples to Apples Big Picture. This game has brought us many evenings of laughter! The photos are so funny and the kids are expanding their vocabulary as they go. 7. Battleship. Tried and true. Really only our older girls are liking it, and I kind of groan when it comes out because all of those pegs never seem to make it bad in their entirety to the box. But it’s fun enough. 8. Uno Attack. Regular Uno is fun, but Uno Explode adds an element of surprise to the adventure that can’t be replicated. We’ve ended up taking all of our Uno cards from various games and putting them in the Attack. 9. Telestrations. This one is really for grown ups and works best in a group. We did it at a homeschooling retreat where no one knew each other exceedingly well and it was hilariously fun. 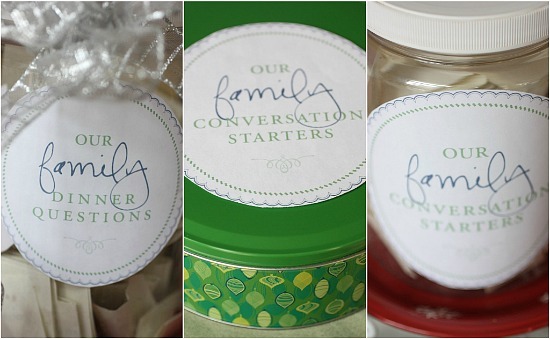 Bonus: Probably our favorite pastime during dinner is the Jar of Questions. We received this as a Christmas gift from a good friend three years ago and still love it to bits now. You can make your own easily – and here is the blog with links to the questions and template so you can print it for yourself for free: Family Conversation Starters. Really… this one is amazing! What are the games you play in your family? Have you successfully quit television? How did you do it? I’d love your advice and feedback! ** Just as an update, believe it or not, that soccer team I wrote about last time that had never even won a game… won the entire tournament yesterday! Unbelievable and super exciting for them! I think it will be really interesting to see how their “I’m just not competitive” attitude withstands the experience of actually winning and coming in on top? I’ll keep you posted!